We launched a new site today at APN Online, which I think is going to do good things for us. 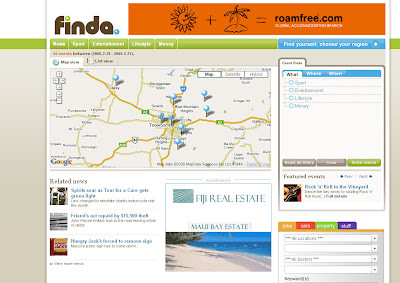 Finda.com.au has its first iteration in Toowoomba, and we're planning on rolling it out to the rest of regional Queensland and Northern NSW over the coming months. It's initially focusing on news and events. But it has a few nice features enabled by the crossover taxonomy and geo-targetting that allows news stories and diary events to be themed together under content or category types. This sort of data configuration allows a lot of flexibility in the way you can mix and mash content. Stay tuned for more releases soon.